Armor Games has released some damn fine browser games over the past few months since we first started the Alt+Escape feature, and Use Boxmen is no exception. The concept of the game is simple - little box figures need to collect cardboard boxes by using each other in order to solve puzzles. The game itself is great and pretty unique, but what really ties the whole thing together is the aesthetic - the scribbled stick figures, the friendly (and self-deprecating) narration between every level, and the music. Did we mention the music? The music is awesome. So yes. 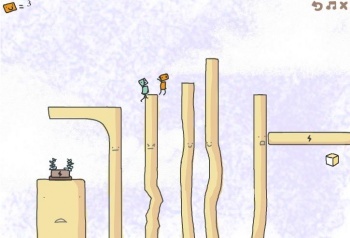 Use Boxmen is a lovely little complete package of a clever little puzzle platformer, wrapped in a great soundtrack and a wonderful dreamlike aesthetic. What else could you want?